If you want to invest in Forex market but you don’t have time to learn how to trade forex, forex managed accounts are what you are looking for. Forex managed accounts give you the possibility to invest in Forex through the management of a trader. Forex market is the most active market in the world because it moves very fast and is more liquid than others. For all this the transaction costs are lower and it is becoming very popular for investors. Otherwise forex market can be dangerous for who do not have the needed experience and sophisticated knowledge. That’s why a forex managed account gives the possibility to take advantage of the expertise of an experienced forex trader. Investment Program 1 is a strategy based in fundamental analysis for trading the ‘News’. This ‘News strategy’ has many months of huge profits at year with a very low DrawDown. It has only few precise operations every month. It gets high annual profits with a very low risk. 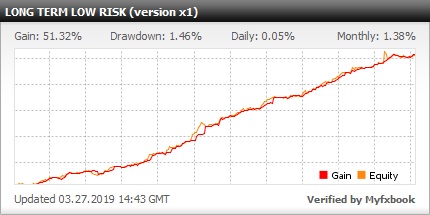 Investment Program 2 (version x6) is a Long-term Low-risk strategy with an 8% of average monthly profit and an 8% of maximum DD (inception 2016). It uses machine learning to analyze an universe of alternative data which includes global real-time market sentiment for a giving trading instrument derived from various private sources across all tiers of markets participants. 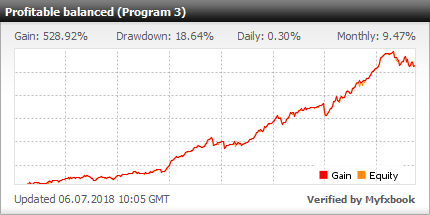 Investment Program 3 is a trend follower/intraday strategy made with a selection of several profitable strategies that combined gives a steady profitable performance with a controlled DrawDown. This steady profitable strategy can have months of more than 20% profits. Those months average with other months with lower profits, giving an average monthly profit of around 10%. Investment Program 4 is a long term institutional intraday strategy. It’s designed to be a conservative trading strategy for investors whom look for calm long-term profitable trading. It has a great equilibrium among the average monthly profit and maximum DrawDown. It’s designed for big investments that look for a steady annual profitable performance. Investment Program 5 is a Day trading strategy. All the trades have a SL and a TP. One of the main characteristics of this strategy is that it has around 80% of positive trades, making it a very a secure steady profit maker strategy. It also gets several months more than 20% of profits. The back test of several years gives an annual profit of among 110% and 130%. This strategy can be managed half risk. Investment Program 6 is a very profitable aggressive intraday strategy. This high profit program has a great equilibrium among the maximum average monthly profits and the maximum DrawDown. It’s managed at its maximum risk, in a way that it can accomplish the goals of investors that look mainly for a high profit’s intraday strategy with a moderate risk. It’s also available a version of half risk for investors that want high profits, but they don’t want to afford much Drawdown. In forex managed accounts a money manager trades on a client’s behalf. Forex managed accounts let you hire a trader with trustable experience in Forex trading in order to manage your investment. Inform us about how much funds you want to invest. Know which Forex program fits you better and choose the best strategy for you. Take profit of their knowledge and trustable experience. The foreign exchange market (or Forex market) is the market where the members can buy, sell or exchange currencies. In other words, is the market where currencies are traded. Forex exchange market participants can be commercial companies, investment management firms, banks, retail forex brokers, investors, etc. When investors or traders want to have the opportunity of trading the most important currencies, should open a Forex account. It is a type of account that a Forex trader opens with a retail forex broker. Visit our last posts about Forex Managed Accounts. What are the best currency pairs to trade in Forex? Trading Forex carries a high level of risks, and couldn't be suitable for all kind of investors. A high degree of big leverage can work against anyone, also for you. Before taking any decision to invest in Forex Services you should consider your Knowledge about Forex, investment objectives, asking to professionals if need it, and your risk appetite. There is a possibility that you may have a loss of part or all of your initial investment and so you shouldn't invest money that you can't afford to lose. Be aware of all the risks associated with Forex and look for the reviews needed to be sure. of your possibilities of investment. Seek advice from an independent financial advisor if you think you need it. FxMAC is a trademark of the company The Best Secure Trading Consulting, Corp. registered by FSA with number 20558IBC2012, in accordance with the International Business Companies (Amendment and Consolidation) Act. The objects of The Best Secure Trading Consulting, Corp. are to provide top forex managed services and reliable best managed account services in currencies, and leverage financial instruments. FxMAC offer Forex services in USA, Australia, UK, Europe, Switzerland. Singapore, South Africa, all over the world. The Financial Services Authority (FSA) of SVG certifies that The Best Secure Trading Consulting, Corp is in compliance with all the requirements of the International Business Companies (Amendment and Consolidation) Act and in good standing with this Authority. This information here exposed doesn't constitute, may not be used for the purpose of, an offer or as a solicitation to anyone in any of a jurisdiction which such an offer or such solicitation isn't authorized or to any persons to whom it is unlawful making such offer or such solicitation. 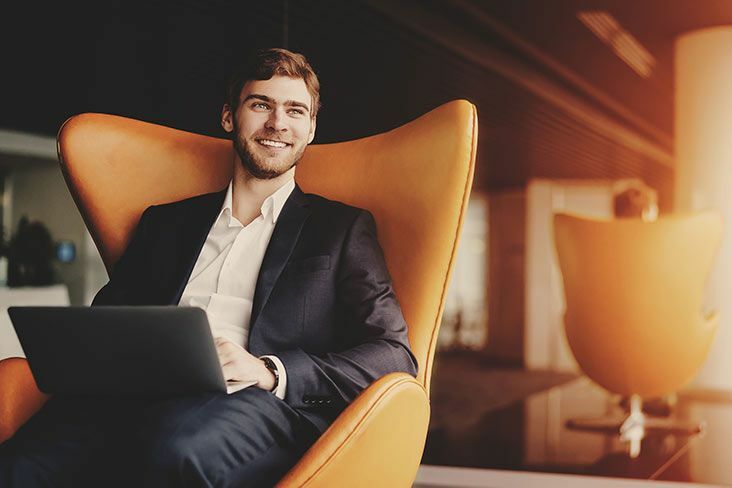 Prospective investors shouldn't construe the contents of this information here exposed as a legal, tax or any financial advice. FxMAC doesn't provide services for residents in jurisdictions in which such service delivery is not authorized. FxMAC is not authorised or registered in UK by the Prudential Regulation Authority (PRA) and/or the FCA, or is neither exempt. Our commercial office in UK is applicable only for non- UK residents meeting the criteria for becoming eligible clients. Forex Investment Program 6 is a very profitable intraday scalp strategy. It can work with balances of maximum 200k or 250k. All the orders have a Stop Loss and Take Profit placed, as all the rest of our strategies. 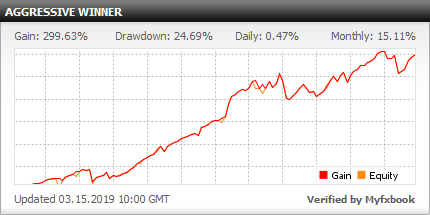 This great investment Program has more than 75% of winner trades, with a Profit Factor of more than 2.50. Be aware that the strategy can be without opening new positions several days during the week. This program is very sensitive to the broker’s liquidity and broker’s spread. It can only be managed in the recommended brokers that the asset managers select. This strategy has a great equilibrium among the maximum risk and the average monthly profit. The client can ask us to manage his funds with less proportional risk. It depends if the client investment reaches the minimum allowed for decreasing the risk. USA CITIZENS and USA CORPORATIONS accepted in the professional broker Fxchoice. Broker: Managed only in the Australian regulated broker Vantagefx. Except USA citizens that are managed in the broker Fxchoice. Performance Fee commission: 35%.This Forex trading program could have a decrease of PF with investments from 15k onwards. Forex Investment Program 5: This strategy is an intraday strategy. All the positions have assigned a SL, and TP and the positions are closed because it reaches the TP or the SL. It can be several days without opening a trade until the strategy finds the correct opportunity for getting a positive trade. It opens an average of 20-30 positions per month. This strategy has a remarkable around 80% of profitable trades. It means that only 20% of the trades hasn’t been of profits. Broker: Managed in exclusively in the MAM we have in the ECN regulated broker VANTAGEFX. Performance Fee commission: 35%. This Forex trading program could have a decrease of PF with investments from 15K onwards. 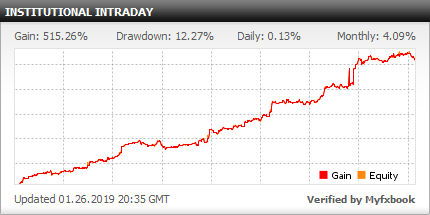 Forex Investment Program 4: This great steady INSTITUTIONAL INTRADAY trades in the 3 sessions Europe / USA / Assian. During the Europe and USA session trades EURUSD following the short-term trend and it enters during periods of high volatility. During the Assian session the Asset Managers use overbought/oversold levels to identify reversion patterns to find trading opportunities. This Intraday strategy trades EURUSD, AUDCAD, GBPAUD, USDCAP, USDJPY, EURJPY and GBPUSD. The expected annual profit of this long-term perfect institutional strategy is of 60% of the investment. By incorporating this effective trading model among our Funds Management services allows to the Asset Managers to take as the main objective a consistent increase of client’s capital with minimum possible trading risks. The optimum client’s profile for this great institutional strategy are: Private Banks, funds, insurance organisations, several public persons and big private investors. We also accept regular retail clients to this Fund. Performance Fee commission: 35%. This forex trading program could have a decrease of PF for investments from 100K onwards in version x1 and from 50k onwards for version x2. What’s a Capital Protection? When the account reaches the % of negative floating orders then all the open orders are closed automatically, and the trading stopped until the traders decide to reactivate it. 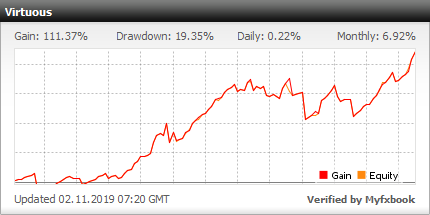 Forex Investment Program 3: This great steady low risk strategy holds the open positions only for few hours, exceptionally few days, reducing like this the exposition in the Forex Market. This trend strategy trades majors as EURUSD, EURAUD, USDCFH, EURGBP, GBPAUD, etc. The expected annual profit compounded of this long-term perfect institutional strategy is of 200% of the investment. The positions are opened accordingly to a developed algorithm which gives the most reliable profitable trades. All the opened positions have a Stop and a Take Profit (it can be hidden or public). Every single trade is controlled by the Asset Managers team. This profitable intraday strategy have gotten sometimes among 25% and a 40% of monthly profits. Performance Fee commission: 35%. This investment program could have a decrease of PF for investments from 25K onwards for version x1 and from 15k onwards for version x2. Forex Investment Program 2: This is a long-time very low risk strategy designed for institutional hedge funds. In the version x1 the maximum DD is lower than 1.5% and the average monthly profit is of around of 1.5% since the inception (2016). This strategy allows to have a version of x6 times bigger lot size for clients that can invest at least 100k onward. Achieving an 8% of average monthly profit with a similar 8% of maximum DD. This is a strategy that uses machine learning for analysing an alternative data universe which includes global real-time Forex market sentiment for a trading instrument derived from several private sources across all levels of markets participants. Investment Program 2 is made of a combination of fundamental and traditional technical indicators and other methods that include discretionary human application of every single open order. USA CITIZENS and USA CORPORATIONS accepted (investing minimum 100k onward). Broker: Managed in exclusively in the MAM we have in the ECN regulated broker VANTAGEFX. Be aware that USA citizens are managed in other brokers (and their minimum investment allowed are bigger than the investors from the rest of the countries). Performance Fee commission: 35%. This Forex trading program could have a decrease of PF for investments from 100k onward (version x6) and from 250k onward (version x1). What’s a Funds Protection? If the account would reach the percentage of negative floating orders then all the open orders are closed automatically, and the trading stopped until the traders decide to reactivate it. Forex Investment Program 1: This INTRADAY strategy is based on trading on macroeconomic News Event, following the direction of the spike. The exit levels as well as the position sizing are set by the trading team on the basis of accurate analysis on deep historical series for estimating the deviation of the incoming. This Forex trading program trades with an average frequency of 1-2 trades per week, some months can have few trades and some others can get more trades done. The trades are always equipped with stop loss exiting levels and the position sizing is always set in order to maximize the profit (and minimize the risk) in relation to the incoming news outcome. The strategy uses additional filters to defend the account against potentially damaging slippage during extreme volatile market events. Trading program 1 regularly double some trading accounts some months. In fact we have been known to double some accounts in only 1 trade. There will inevitably be times when sometimes the strategy doesn’t make much profit. Trading program 1 will only fire trades if the risk/reward is very high, if those conditions don’t arise, then it’s better to be patient and wait. The Asset Managers of Forex trading `program 1 combine their 30+ years of conservative Forex trading experience with their excellent IT knowledge. The result is probably the most advanced Forex trading program on the planet. The most traded currency pairs are GBPUSD, USDSEK, USDNOK, USDJPY, AUDUSD, USDCAD, EURUSD, NZDUSD and some crosses more with the same strategy in order to make a better diversification. This high profit’s Forex trading program has a 50% of PF. Trading program 1 is managed in different ECN regulated brokers, mostly with FCA, ASIC, CYSEC regulation. This Forex trading program will have different results in different brokers depending of the broker’s liquidity. This News Forex trading program gets high profits with small balance accounts. For this reason the investment will be divided in several brokers. So, every client will be informed of which broker’s combination are the best in the time been for his investments. Trading program 1 is a ‘News trading program’ and this kind of performance make that this Forex trading program is the only one of ours that the results of the masters showed in our website aren’t the same than the client’s accounts. Actually 5 different accounts in 5 different brokers will have 5 completely different results, even though the signal received in all the accounts are always exactly the same signal. Due News Forex trading program are high sensitive to the broker’s liquidity in News time. We recommend to open the accounts in Euros to make it easy in the monthly payments of our PF commissions. Broker: Managed in different broker’s combination chosen only by the money managers. Regulation: Fca, Asic, CySec, etc. Performance Fee commission: 50%. It’ll be paid for each investor every month from 1st and 5th of the next month by bank transfer and Skrill (The payments will be calculated and paid in Euros).